What did I do wrong this week? Now, it’s not some major confession. It’s not one particular thing that I did wrong, but I just recently realized something important. I have spent all my time on previous podcasts explaining tips on how to make little tweaks to your marketing, to your copy,and to your work life that will help improve it. However, that may give the impression that I am perfect and I’m far from perfect. I get a lot of things wrong. Now, I’m from England and we are quite reserved. We are not known for admitting our faults. In America, it’s greatly encouraged in the entrepreneurial world to fail. learn from that and then share that with others. In the UK, failure is not looked on in quite the same way. So, we are built differently. Since I have shared with you about all the how tos and tips, I decided it was time I told you about some of the things I get wrong and how this happens all the time. 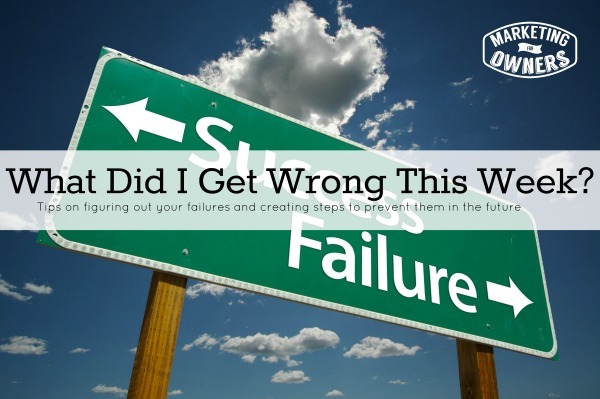 Today, I am going to go through a list of 5 things that I got wrong recently. When I first start my day, the first thing I do when I get to work is open my Inbox. I start to deal with e-mails, answering and replying, sending to others, and before you know it, those emails have consumed a better portions of my morning — basically running my day. By the time I am finished dealing with those, I’m already behind on the task I wanted to do. Of course, I do have others who take care of some of my emails, but I am talking about the ones I personally have to answer. What I’m doing is allowing some mails to dictate my time, my, my calendar, and most of my day. I’m working for them. They are getting my attention. That shouldn’t be right. E-mails should be given a time, an allotted time and then once that time has ended — stop. Move on to something else. I really need to work on that. I have been making myself a list of to-do’s every day, and I really want to focus on getting at least the first two on the top of my list completed daily. However, other things come up and I allow myself to distracted just as I did with e-mails, so I’ve got to work harder on keeping those two to do’s at the top of the list and getting them done first before I do anything else. Those two important things will progress and possibly make me some money. Thirdly, I do too much. Actually as you may know, I run a number of companies and I’m hands-on in these companies. I have a staff. I have teams. But, we are usually working and progressing toward a new project. We are always setting new goals and advancement. So, I actually do work in the companies, and because of that, I take on a lot and sometimes it’s too much. However, I am impatient. I can’t wait for the next quarter to add them in so I try out another couple. I’ve got to try and do less and move more slowly and learn to be a little more patient. Now, I am creating a fabulous new course for you. It’s completely free. It will have around 16 parts and each one is a video. There is a lot to do, so it needs to be done quickly. I’m behind on getting these started. I need to set better goals for each week. I need to prioritize what gets done in that week and set my to do’s based on that. That course is very, very important. By not doing that, I am leaving money on the table, meaning, I am losing potential clients and customers. Now, many projects are not major projects. Many projects are things that can be done in one sitting. Quite often, there is one little thing left. For instance, if I set up a lead page, then there are forms to create. The code is set up. The download it set up. It’s going to be made live in a few days. Quite often, just that final thing, like the thank you page will not be made. It will be forgotten. You think someone else is handling it, and then right at the last minute you are scrambling trying to get it all completed. I need to work on finishing things before I go in to the next shiny project and work on that. These things may seem lame to you, but these are the issues that keep me lagging behind. Now, that I have shared with you my 5 things, I want you to do the same. I want you to accept what you get wrong and try and improve it. The reason is if we can constantly improve little by little the compound effect is fabulous. You will grow. You will improve. You will triple your profits. 1. 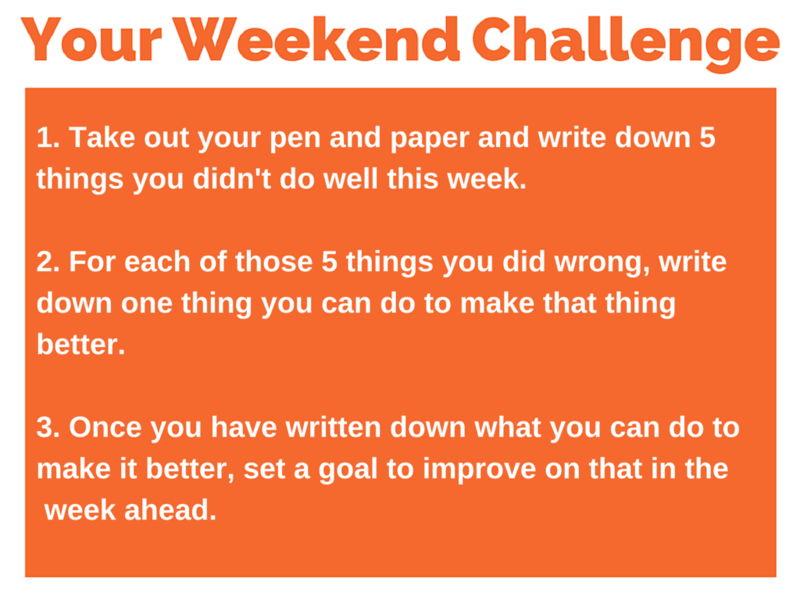 Get out your pen and paper and write down 5 things you didn’t do well this week. That can be anything. It can be in your personal life if you want. I prefer to stick to business because in this podcast we are trying to help you save time in your marketing and set up effective marketing to progress your business. It doesn’t matter what they are. Nobody is going to see your list — only you. You don’t even have to tell me. This is for you. It’s private, so don’t be shy. Write them down and be honest with yourself. 2. For each of those 5 things you did wrong, write down one thing you can do to make that thing better. Once you have written down your 5 things you did wrong, then you need to figure out what to do to make that thing better. By writing it down, you are halfway there in your mind by actually admitting and finding the solution. I want you to write down how you are going to improve things next week to try and battle through and stop this thing from happening again. It’s as simple as that. Simple little moves make improvements. 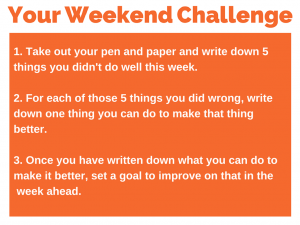 What 5 things did you get wrong this week?